April 3, 2019 - Komatsu has unveiled the first of a new line of surface mining drill rigs featuring autonomous capabilities for safer operation and greater productivity. 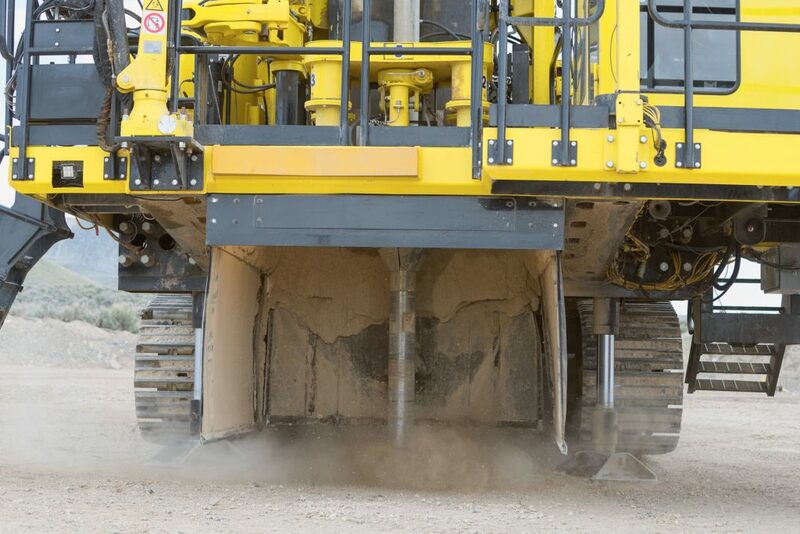 Designed to work in a wide range of applications — from coal to hard rock mining – the P&H 77XR has a bit loading of 35,000 kilograms and has been designed for maximum versatility, according to Komatsu, including the ability to carry out rotary tricone drilling or down-the-hole (DTH) percussive hammer drilling, in single or multi-pass operations. A close up of the Komatsu P&H 77XR’s drill. Komatsu national product manager – mining, Mark Petersen, said the new rig incorporates a number of features that are unique to Komatsu P&H drills, including a new auto bit-changing system and a new boxer-style mast with P&H’s exclusive rack-and-pinion pulldown. “Auto bit changing is a major step forward for surface mining rigs, and the 77XR is the first rig on the market to offer this,” he said. “Quite a few manufacturers have tried to achieve this, and we are the first to come up with a solution. “Our new bit carousel system eliminates the need to change bits manually, speeding up the entire process and minimising the operator’s handling of bits, reducing the risk of strain or injury. “It’s a major safety and productivity advance, as it takes operators out of the line of fire, and it allows bit changes to be carried out within five minutes. Petersen explained that the new rig’s rack-and-pinion pulldown has been a standard – and exclusive – feature on P&H drills for many years; the only difference to the rest of the P&H Drill product line is the introduction of the boxer style mast. “The combination of the boxer-style mast and rack-and-pinion pulldown give significant advantages in productivity, reliability, bit-loading performance and maintainability,” he said. “Our boxer-style masts have only four weld joints running the length of the mast compared with the multiple weld-points of conventional lattice-style masts, making it easier to identify any cracks or other issues, and simpler and quicker to repair. P&H’s proven rack-and-pinion carriage system delivers the same amount of retract force as pulldown force, to assist operators in the toughest conditions, according to Petersen. “Our optimised single rack design engages the pinion in tandem to improve reliability and maximise bit-loading performance,” he said. Komatsu confirmed other improvements on the 77XR include a new and improved lightweight rotary head, allowing the operator to raise and lower the mast with the carriage in the top position and the complete drill string attached. “This reduces non-productive pipe handling time and streamlines the process of tramming between patterns,” said Petersen. “Our redesigned mast and carriage also enables effective single and multi-pass angled drilling,” he said. The 77XR can reportedly be fitted with P&H’s high-precision automation solution for improved drilling safety and efficiency. Combined with a HawkEye camera system, the drill control system is alerted to any objects or hazards in the drill’s path and can take appropriate action, according to Komatsu. “Our P&H drill automation system improves safety and removes variability, leading to increased utilisation and, ultimately, higher drill performance,” said Petersen, adding that the innovations and advances on the new rig helped minimize non-drilling time, translating into up to 12 percent more drilling, reducing maintenance costs by as much as 10 percent maintenance cost reduction and up to a 5 percent increase in productivity. “With drilling and blasting at the heart of any surface mining process, the more quickly, precisely and efficiently a mine can execute its drill patterns, the more effective the resulting blasts.